2 oz. 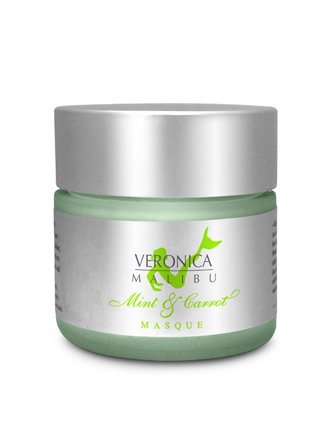 – The VeronicaMalibu Mint & Carrot Masque is recommended for normal, combination, normal to oily and blemished skin. It is a stimulating and effective masque that leaves the skin with a refreshed and renewed glow. To be used twice a week to maintain a clear complexion. Will prep our skin for the red carpet! A facial at home. Kaolin, Aloe Vera Gel, Bentonite, Glycerin, Zinc Oxide, Carrot Oil, Sodium Alginate, Menthol, Retinyl Palmitate, Chlorophyll, Spearmint Oil, Peppermint Oil, Potassium Sorbate, Citric Acid. On thoroughly cleansed skin, make a paste with warm water and apply a thin layer to face, carefully avoiding eye area. Leave on for 15-20 minutes, then rinse with warm water. Use twice a week.